In the annals of food cures, one whole grain rises to the top of the pile. 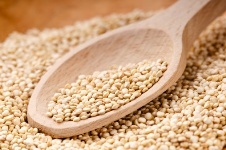 Its name is quinoa, and here, in the final part of this short series, are three more compelling reasons why nutrition experts consider it a “superfood.” Read part one of this series for the first four common health problems solved by quinoa. van Dam RM, et al., “Dietary calcium and magnesium, major food sources, and risk of type 2 diabetes in U.S. Black women,” Diabetes Care October 2006; 29(10): 2,238-43. Berti, C et al., “Effect on appetite control of minor cereal and pseudocereal products,” British Journal of Nutrition November 2005; 94: 850-858.